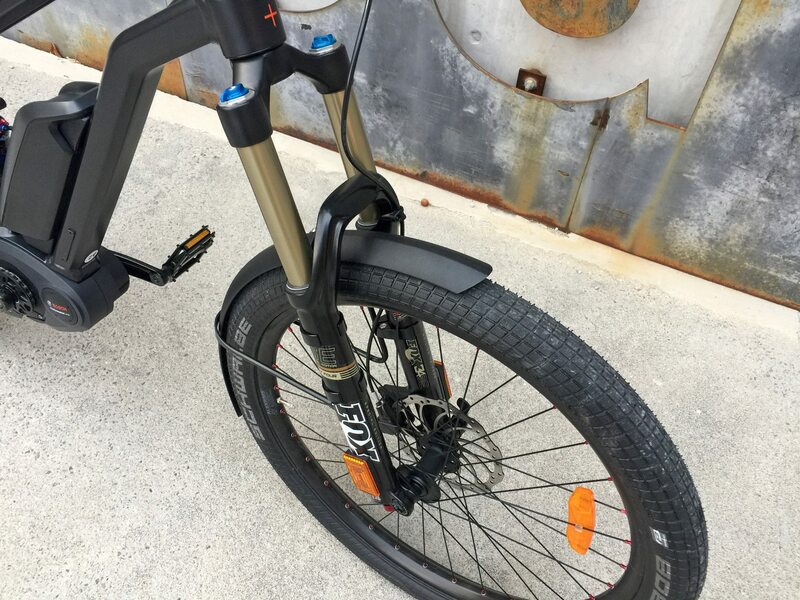 The StarckBike Asphalt is part of a series of electric bikes created with input from Philippe Starck, a famous designer known for his work on hotels, restaurants and even electric cars, for Moustache, a French ebike company. 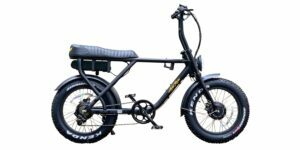 Philippe’s interest in “where and how people live” has led to “simple but inventive structures” according to Wikipedia and those values are reflected in the Asphalt electric bicycle. 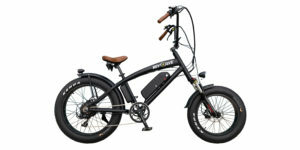 It’s a very complete and thoughtful ebike but one that remains simplified and elegant in several ways… You can see this reflected in the fender mounts and all-black color scheme (conveniently matching stock battery and motor casing colors). 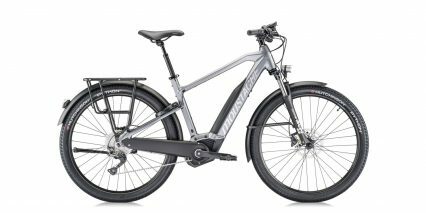 From my own ebike-enthusiast perspective, what you have here is a uniquely styled product that’s using top of the line hardware and components from leading manufacturers like Bosch, Shimano, Supernova, Magura and Fox. 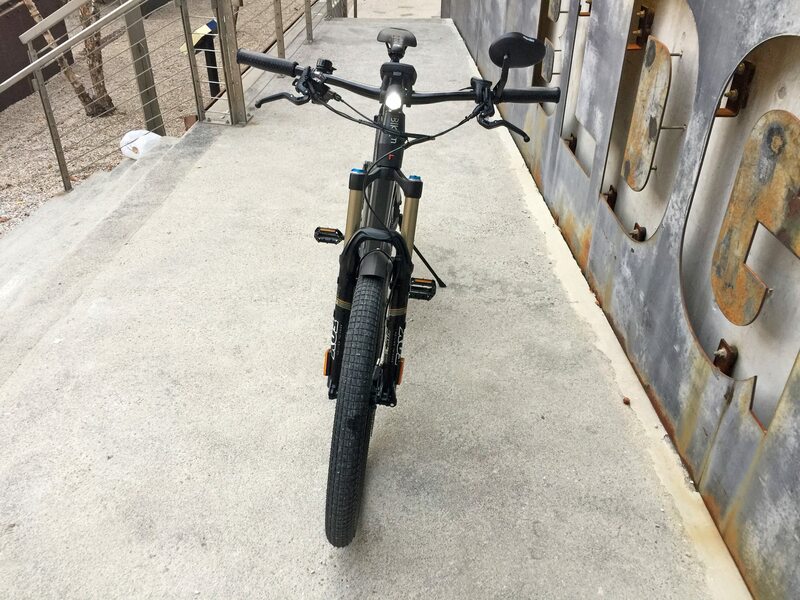 The Asphalt is a mountain-capable electric bike that’s designed for urban environments. 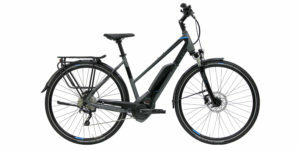 Air suspension cushions the 28 mph top speed, tight tubular fenders hug both wheels providing protection without rattling or impeding your movement, angular tubing with an oversized headset and stiff thru-axles on both wheels deliver power directly to the road vs. flexing under pressure and the sloped top tube allows for easier stand over positions. 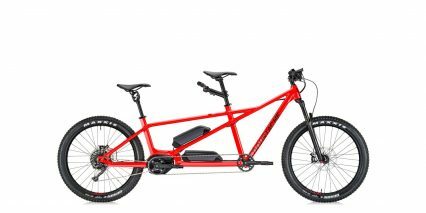 It’s a bike that will work for a range of body types because it’s available in three sizes. 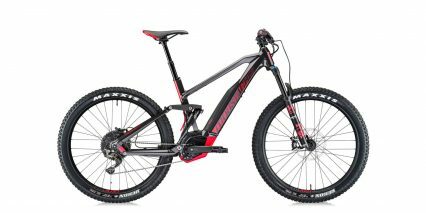 To me, it almost looks like a lightweight motorcycle or something and the higher top speed delivers on those looks. 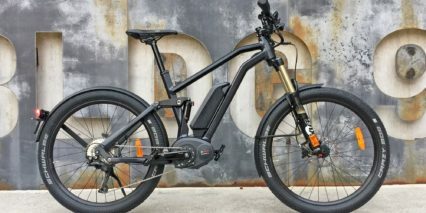 Unfortunately, if you live in the US, it’s not an e-bike that’s going to be easy to find and test ride at dealers (at least at the time of this review). 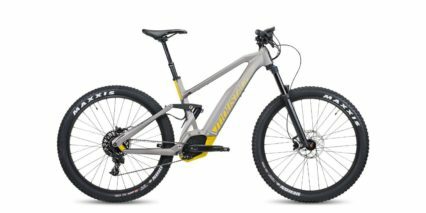 I saw it while traveling through New York city during a visit to Propel Bikes, a retailer known for importing unique products. 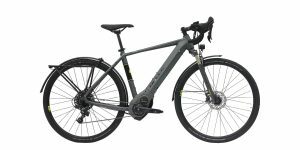 You do pay a premium for the design element but with top-end hardware (repairable and replaceable by most leading bike shops) it should last and could be worth it for some. 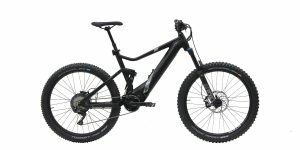 There are only a handful of speed pedlecs with full suspension designs out there today to begin with and as someone with a sensitive back and neck… it’s my preferred way to travel if budget allows. 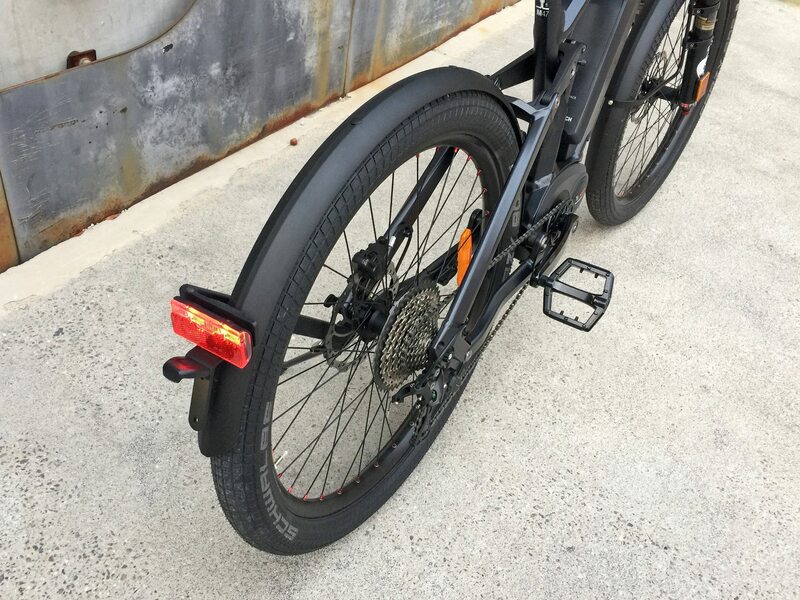 Safety and utility are addressed well through integrated lighting, reflective surfaces and the designer fenders. Perhaps the one area that’s lacking is cargo utility. 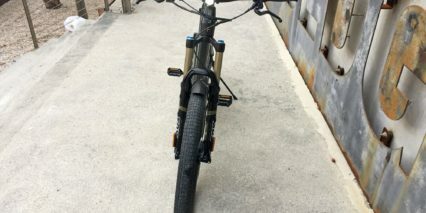 As with many full-suspension bikes, there isn’t a rack or mounting provisions to add one yourself. Beam racks can get the job done but are easily bumped out of position from side to side… so wearing a backpack might be your best option but that can reintroduce the back and neck sensitivity issue. 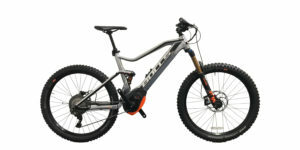 Thule has an interesting Pack ’N Pedal rack that might work here. 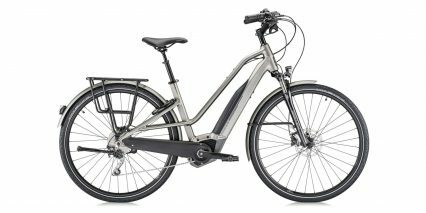 Driving the bike is a Bosch Performance Line speed motor offering 350 watts nominal power with up to 63 Newton meters of torque output. 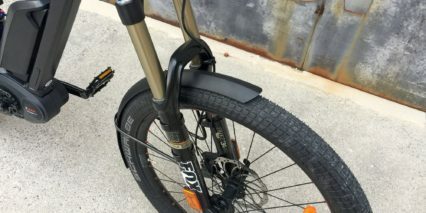 It uses a smaller chainring that can spin up to speed or stop quickly and Moustache has designed a nice bash guard guide plate to keep your pants clear and clean while simultaneously reducing chain drops. 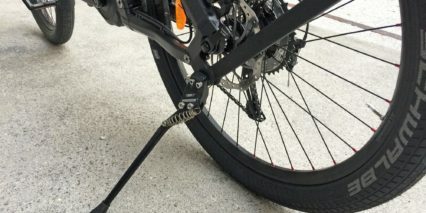 Just below this guard is a guide component that adds even more stability and possibly reduces chain slap on the underside of the swing arm. 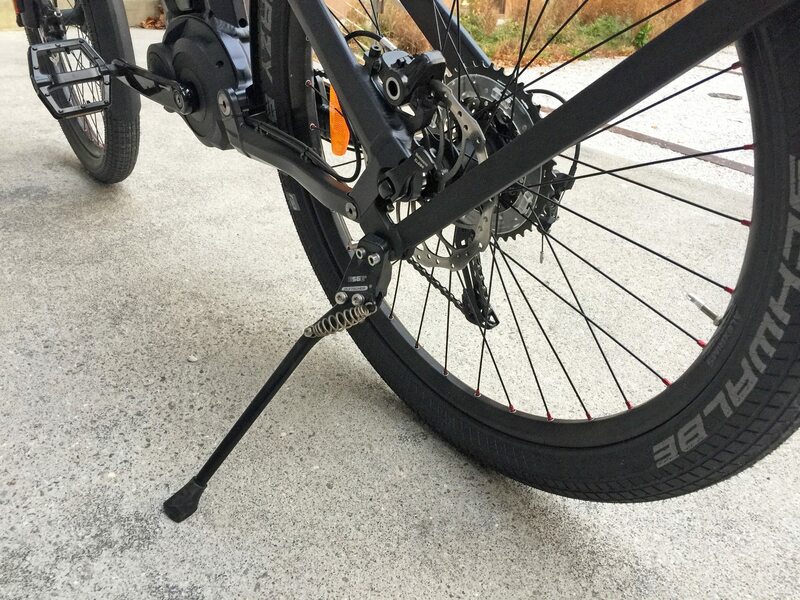 Despite the lack of a traditional slap guard, the top section of the chainstay did not have nicks as I examined the bike before and after my test ride. 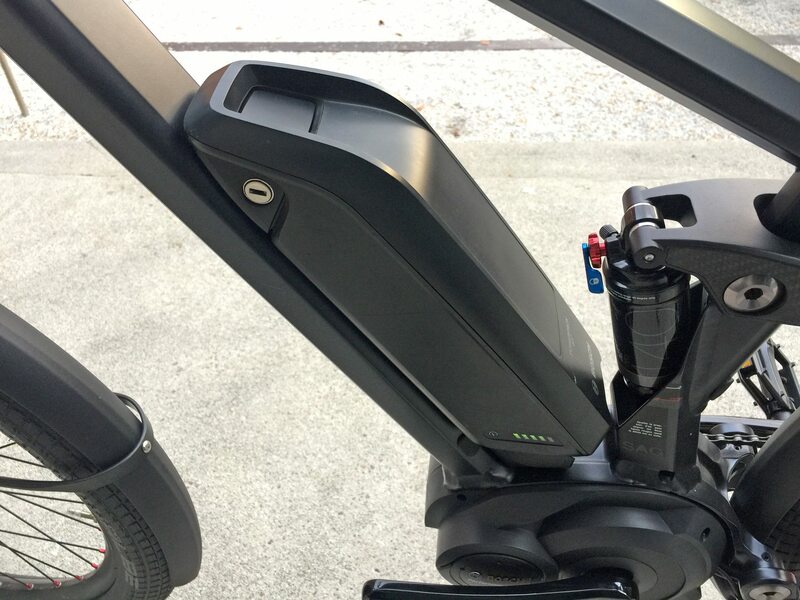 I noticed a plastic slider in place just behind that motor on top of the swing arm pivot bolt which seems to act as yet another guide and slap guard of sorts. It’s all very unique but tight and well thought out. 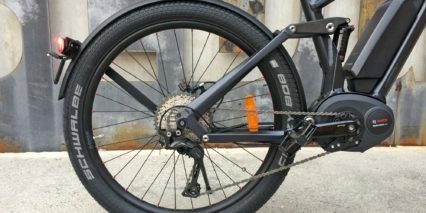 With an 11 speed cogset in the rear using the Shimano Deore XT derailleur with Shadow Plus clutch, you’ve got a range of pedaling options and the benefit of a tighter chain if you engage the clutch by sliding a little plastic lever (as shown on the video review above). I think this part is leftover from the mountain variations of the StarckBike but it’s still useful on this higher speed model. It might add some work to shifting, increasing the physical force to activate the triggers, but it’s cool to see and interesting to experiment with. 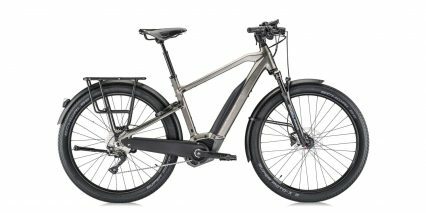 So the chain should stay on track and the derailleur is reliable and adjustable but both benefit from the software driven shift sensing of the controller and motor system from Bosch. The best way to shift is to reduce pedaling force (usually by accelerating for a moment then easing off). 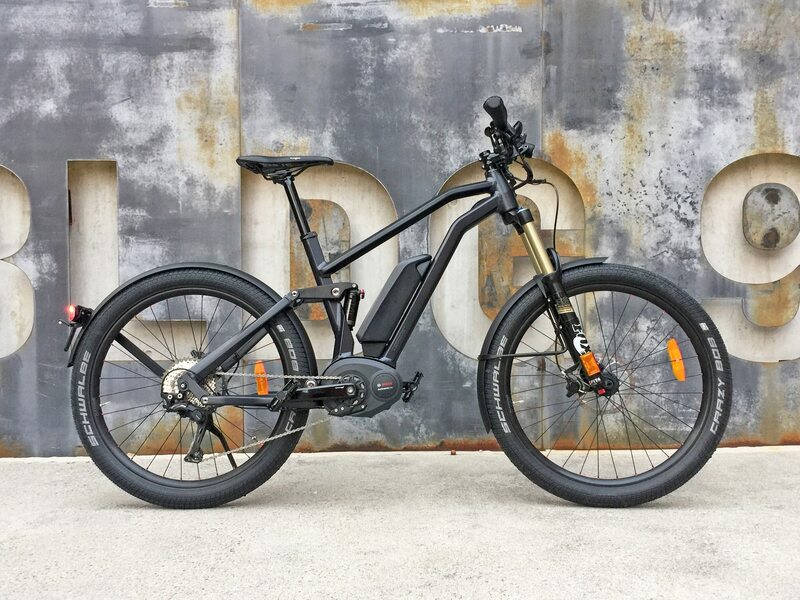 The drive system measures rear wheel speed, pedal cadence and pedal torque 1,000 times per second making it one of the fastest and most responsive I’ve tested. 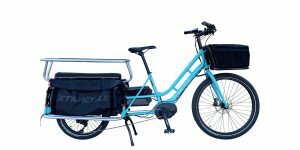 And my favorite aspect is that the motor can hit higher speeds without forcing you to pedal at slower, lumbering, pedal cadence. 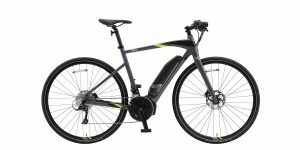 I prefer to spin due to a knee injury and enjoy being able to easily top 20 mph on this bike without pushing especially hard (of course, I’ll usually be riding with the higher levels of pedal assist to do so). The motor box looks pretty good, it works well and despite producing a bit more noise, a higher pitch whine, it’s still fairly quiet. 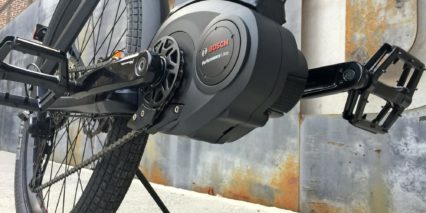 Note that the small sprocket spins about 2x the revolution speed of your crank arms to allow the motor to operate at an efficient speed and generate more torque at start. 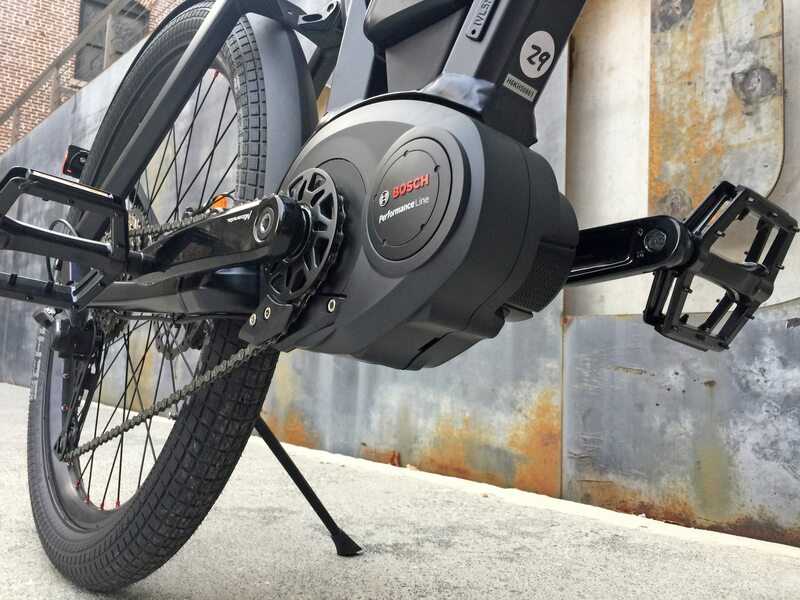 Powering the Asphalt is a standard 400 watt hour Bosch Powerpack battery. 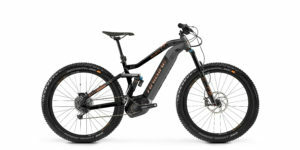 I was a little surprized it didn’t come with a 500 watt hour without paying extra because the bike is already costly. But at least it’s forward compatible. 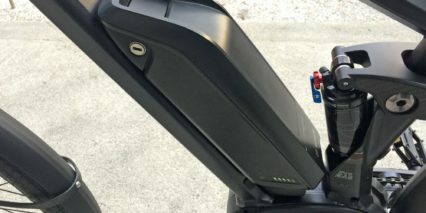 The battery case is sleek, has a handle built into the top so you won’t drop it as easily and can be charged on or off the frame. 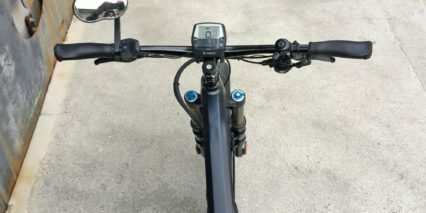 It interfaces with the mount by coming in from above then clicking down at the top and there isn’t a whole lot of room with the rear suspension shock clicker hanging down (and the top tube above) so be careful not to pull up too fast and hard or you might scratch it. 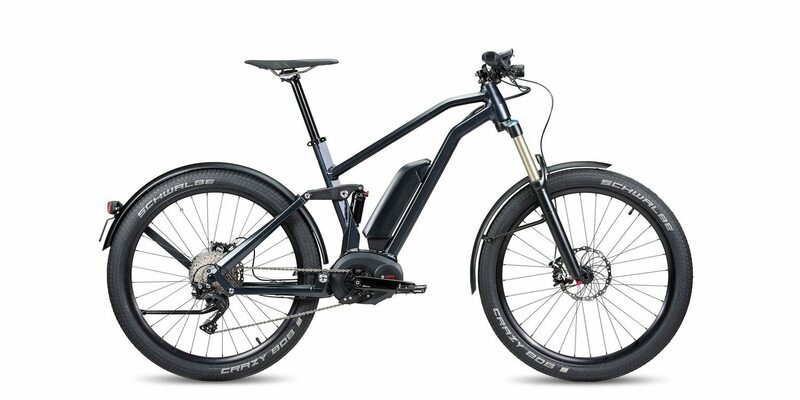 Some other battery designs from Yamaha and Shimano are starting to mount in from the sides to help frame designers lower the top tube further but I appreciate the moderate bend in place on the Asphalt. 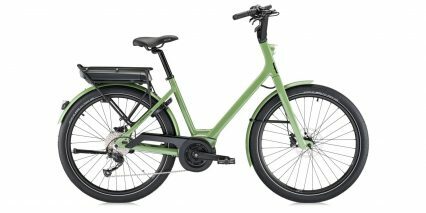 The battery position works well enough but doesn’t leave room for a bottle cage and the downtube wasn’t configured with an extra inset or metal plating to help the pack blend in more like you find on Haibike and some others. One area they did a great job with in terms of “blending” is the internally routed cables. Not only is everything black here (helping to hide cables) but they enter the frame pretty high up and stay hidden. 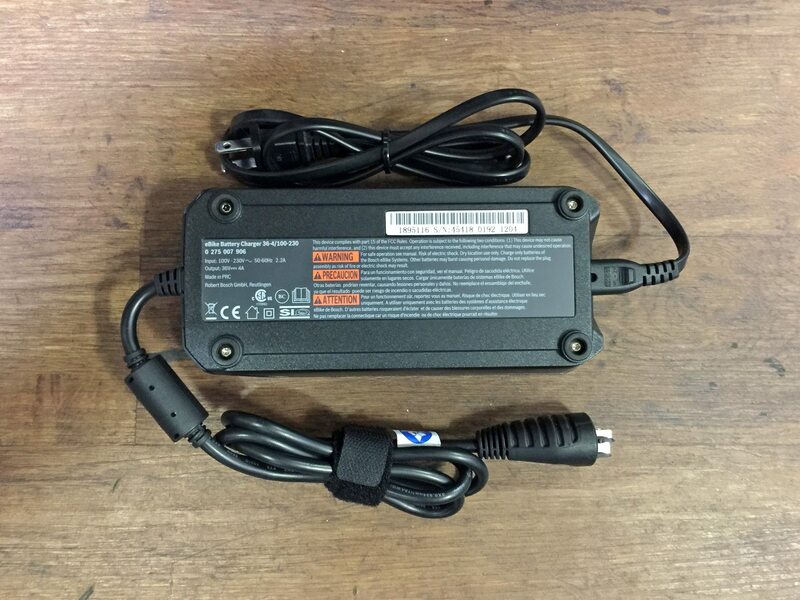 Another highlight is the battery charger which is compact, less than 2 lbs in weight and pumps out 4 Amps vs. just 2 Amps on many others. 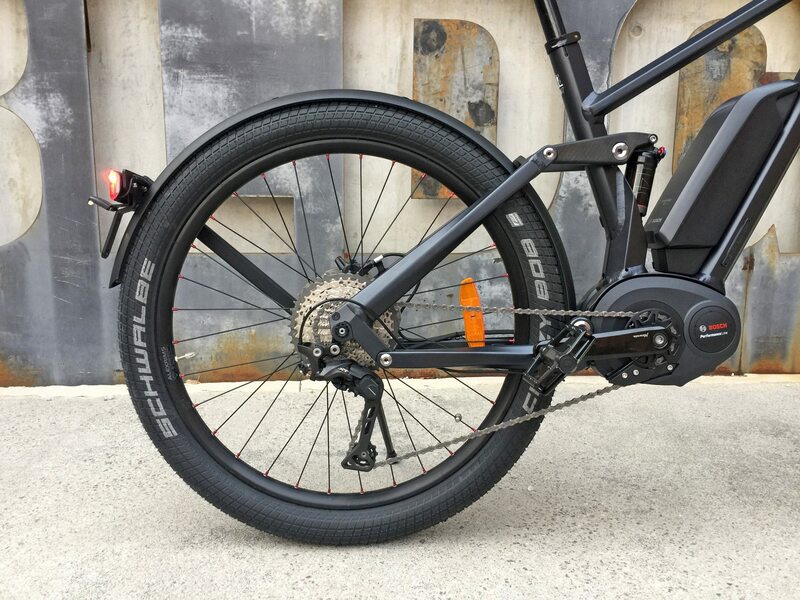 It’s the same Bosch charger you’d see elsewhere but I can’t help but appreciate it for a faster riding, perhaps faster draining, relatively heavy (55 lb) ebike like this. Activating the StarckBike Asphalt is very easy. 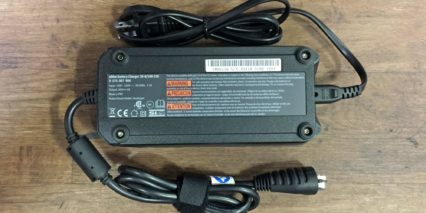 Once the battery is charged and locked into place (it clicks in regardless of whether you have the key in place), simply press the power button on the display console. This is the Bosch Intuvia display which is large and easy to read, sleek looking and removable. 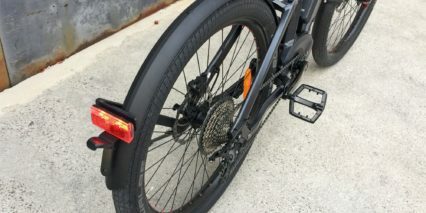 Yes, there is a little set screw you can use to keep it secured if you like… but I appreciate removability for commuting situations where the bike may be locked to a rack in public. This display, combined with a little button pad situated near the left grip, works very well. It shows speed, battery charge level and assist level by default. There are four levels to choose from and I tend to ride in the second one up to maximize range but still feel zippy. Clicking up or down for more or less power is easy to do without looking down thanks to the simplicity and tactile landmarks of the button pad, the center is a rubberized info button that rotates through trip stats and just above and below are up and down clickers. One of my favorite features about this system is being able to use the info button to display a dynamic range estimate on the display. This enables better planning and outshines the five-tick battery infographic. I do wish Bosch had chosen a battery percentage or maybe an infographic with 10 bars instead of just 5 but the range thing helps to make up for it. 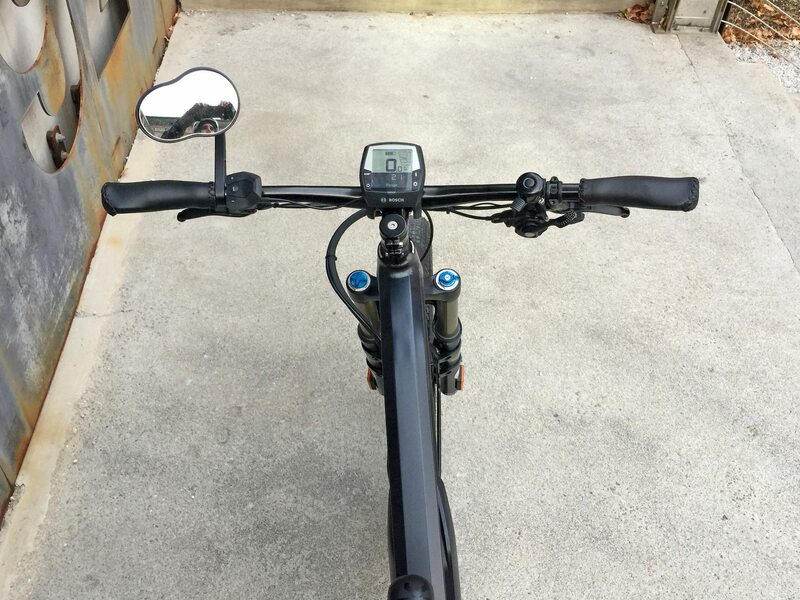 As mentioned earlier, the display also has a five volt Micro-USB port on the right side so you can also use your phone for GPS on the go or perhaps run some additional lights on the bike. I was wondering if you could still get this bike. If it’s possible then from where? Thank you in advance.